Northern California’s inventory woes continued in November, with the number of homes for sale dropping on an annual basis in all Bay Area regions in which Pacific Union operates. Supply fell to a one-year low in Contra Costa County, Marin County, San Francisco, Silicon Valley, Sonoma County, and Sonoma Valley. Click on the image accompanying each of our regions below for an expanded look at local real estate activity in November. The median sales price in Contra Costa County ended November at $1,250,000, tying the high set three times earlier this year. The months’ supply of inventory was 1.0, down on both a monthly and yearly basis. Homes sold in a brisk 21 days and for 99.1 percent of original prices. Defining Contra Costa County: Our real estate markets in Contra Costa County include the cities of Alamo, Blackhawk, Danville, Diablo, Lafayette, Moraga, Orinda, Pleasant Hill, San Ramon, and Walnut Creek. Sales data in the adjoining chart includes single-family homes in these communities. For the 10th consecutive month, the median sales price in our East Bay region was in the seven-digit range in November, at $1,100,000. With a 0.7-month supply of inventory, the East Bay remained one of the Bay Area’s tightest real estate markets. As in October, homes took an average of 18 days to find a buyer. Continuing a trend that has persisted for the past few years, homes again sold for substantial premiums, commanding 114.5 percent of asking prices. Defining the East Bay: Our real estate markets in the East Bay region include Oakland ZIP codes 94602, 94609, 94610, 94611, 94618, 94619, and 94705; Alameda; Albany; Berkeley; El Cerrito; Kensington; and Piedmont. Sales data in the adjoining chart includes single-family homes in these communities. The number of homes for sale in Marin County fell to a one-year low in November, with the months’ supply of inventory at 0.9. The median sales price was $1,227,500, up 15 percent year over year. Homes left the market in an average of 44 days, selling for 98.1 percent of original prices. 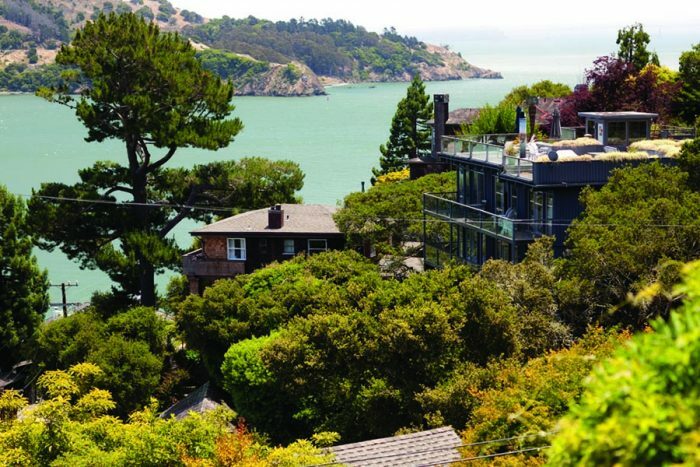 Defining Marin County: Our real estate markets in Marin County include the cities of Belvedere, Corte Madera, Fairfax, Greenbrae, Kentfield, Larkspur, Mill Valley, Novato, Ross, San Anselmo, San Rafael, Sausalito, and Tiburon. Sales data in the adjoining chart includes single-family homes in these communities. At $637,500, Napa County‘s median sales price ended November in the same general range as it has been all year. The months’ supply of inventory was 2.8, the lowest since the summer. Homes sold for an average of 94.1 percent of asking prices, nearly identical to last November, and took 85 days to find a buyer. Defining Napa County: Our real estate markets in Napa County include the cities of American Canyon, Angwin, Calistoga, Napa, Oakville, Rutherford, St. Helena, and Yountville. Sales data in the adjoining chart includes all single-family homes in Napa County. The median sales price for a single-family home in San Francisco was $1,500,000 in November, nearly matching the one-year high set in October. The number of homes on the market continued to dwindle, with the months’ supply of inventory at 0.9. Sellers received an average of 110.2 percent of asking prices, nearly identical to premiums recorded in October. Single-family homes in San Francisco sold in an average of 27 days. At $1,254,825, the median sales price for a San Francisco condominium climbed to a one-year high in November. Inventory moved in the opposite direction, falling on both a monthly and yearly basis to a 1.3-months’ supply. Units sold in an average of 38 days and for 102.9 percent of original prices. Silicon Valley‘s median sales price was $3,050,000 in November, unchanged from the previous month. The number of homes for sale declined to a one-year low, with the months’ supply of inventory at 1.0. Homes sold for an average of 101 percent of asking prices, finding a buyer in 26 days. Defining Silicon Valley: Our real estate markets in Silicon Valley include the cities and towns of Atherton, Los Altos (excluding county area), Los Altos Hills, Menlo Park (excluding east of U.S. 101), Palo Alto, Portola Valley, and Woodside. Sales data in the adjoining chart includes all single-family homes in these communities. The median sales price in our Mid-Peninsula subregion reached a yearly peak in November, finishing the month at $1,885,000. Along with the East Bay, the Mid-Peninsula had the region’s most pronounced inventory drought, with a 0.7-month supply of homes for sale. Sellers received an average of 102.9 percent of asking prices, similar to last November, with homes leaving the market in 19 days. Defining the Mid-Peninsula: Our real estate markets in the Mid-Peninsula subregion include the cities of Burlingame (excluding Ingold Millsdale Industrial Center), Hillsborough, and San Mateo (excluding the North Shoreview/Dore Cavanaugh area). Sales data in the adjoining chart includes all single-family homes in these communities. The number of homes for sale in Sonoma County fell to a one-year low in November, with a 1.1-months’ supply of inventory. As a result, the median sales price increased to $659,000, a yearly high. The pace of sales was identical to November 2016, with homes leaving the market in an average of 67 days. Buyers paid 96.7 percent of original prices, similar to numbers recorded over the past year. Inventory levels in Sonoma Valley were more than cut in half from October to November, with a 2.0-months’ supply for sale. Properties lasted on the market an average of 75 days, almost a month longer than in October. The median sales price was $730,000, and buyers paid an average of 93.9 percent of asking prices. Defining Sonoma Valley: Our real estate markets in Sonoma Valley include the cities of Glen Ellen, Kenwood, and Sonoma. Sales data in the adjoining chart refers to all residential properties – including single-family homes, condominiums, and farms and ranches – in these communities. The median sales price for a single-family home in the Lake Tahoe/Truckee region ended November at $699,000, just a few thousand dollars lower than in October. Homes sold for an average of 92.6 percent of asking prices, nearly identical to the previous two months. The Lake Tahoe region had a 2.7-months’ supply of single-family homes for sale, with buyers taking an average of 83 days to close a sale. Defining Tahoe/Truckee: Our real estate markets in the Lake Tahoe/Truckee region include the communities of Alpine Meadows, Donner Lake, Donner Summit, Lahontan, Martis Valley, North Shore Lake Tahoe, Northstar, Squaw Valley, Tahoe City, Tahoe Donner, Truckee, and the West Shore of Lake Tahoe. Sales data in the adjoining chart includes single-family homes in these communities. The number of condominiums on the market in the Lake Tahoe/Truckee region sunk to a yearly low, with a 2.8-months’ supply of units for sale. The median sales price was $477,500, a 27 percent annual increase. Condominiums sold in an average of 122 days, nearly identical to October’s pace, and for 96.4 percent of original prices. Defining Tahoe/Truckee: Our real estate markets in the Lake Tahoe/Truckee region include the communities of Alpine Meadows, Donner Lake, Donner Summit, Lahontan, Martis Valley, North Shore Lake Tahoe, Northstar, Squaw Valley, Tahoe City, Tahoe Donner, Truckee, and the West Shore of Lake Tahoe. Sales data in the adjoining chart includes condominiums in these communities.